Start off your visit on the 12th (Fri): take in the architecture and atmosphere at Hallgrimskirkja, then get a taste of the local shopping with Laugavegur, then get engrossed in the history at Landnámssýningin/The Settlement Exhibition, and finally explore the striking landscape of Thingvellir National Park. Keep things going the next day: get engrossed in the history at National Museum of Iceland and then trot along with a tour on horseback. To see other places to visit, maps, reviews, and more tourist information, you can read our Reykjavik trip builder app . Sao Paulo, Brazil to Reykjavik is an approximately 20.5-hour flight. The time zone changes from Brasilia Time (BRT) to Greenwich Mean Time (GMT), which is usually a 3 hour difference. Prepare for cooler weather when traveling from Sao Paulo in April: high temperatures in Reykjavik hover around 7°C and lows are around 0°C. Finish your sightseeing early on the 13th (Sat) to allow enough time to travel to Reykjahlid. 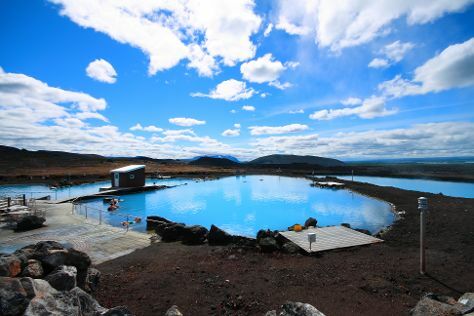 Kick off your visit on the 14th (Sun): explore the activities along Lake Myvatn and then witness a stunning natural landmark at Myvatn Nature Baths (Jardbodin vid Myvatn). On the 15th (Mon), you'll have a packed day of sightseeing: get up close to creatures of the deep with a dolphin and whale watching tour and then admire the sheer force of Dettifoss. To find ratings, maps, more things to do, and other tourist information, use the Reykjahlid trip planner . Getting from Reykjavik to Reykjahlid by combination of flight and bus takes about 4 hours. Other options: drive; or take a bus. Expect a daytime high around 5°C in April, and nighttime lows around -1°C. Cap off your sightseeing on the 15th (Mon) early enough to travel to Hvolsvollur. Hvolsvöllur is a small town in the south of Iceland about 106 km to the east of Reykjavík.It is situated in the inland swamps of Landeyjar, in the municipality of Rangárþing eystra and has, as of January 2015, 934 inhabitants.OverviewThe name of the town literally translates to "Hillfield". Kick off your visit on the 16th (Tue): explore the activities along Kerið and then head outdoors with Hekluhestar. Get ready for a full day of sightseeing on the next day: admire the sheer force of Nauthusagil Waterfall, stroll through Southcoast Adventure, and then take in the dramatic scenery at Seljalandsfoss. 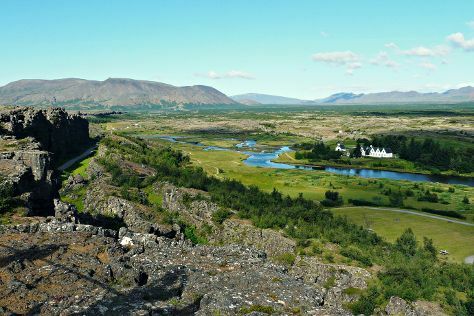 Make your Hvolsvollur itinerary with Inspirock to find out what to see and where to go. Getting from Reykjahlid to Hvolsvollur by combination of bus and flight takes about 6 hours. Other options: drive; or take a bus. Traveling from Reykjahlid in April, you can expect nighttime temperatures to be somewhat warmer in Hvolsvollur, with lows of 3°C. Cap off your sightseeing on the 17th (Wed) early enough to go by car to Vik. On the 18th (Thu), enjoy the sand and surf at Black Sand Beach, then trek along Fimmvorduhals Hiking Trail, and then take in the dramatic scenery at Skogafoss. Keep things going the next day: explore the striking landscape at Dyrholaey, then explore the striking landscape at Sólheimajökulll, and then enjoy the sand and surf at Reynisfjara Beach. To find where to stay, more things to do, ratings, and more tourist information, refer to the Vik trip maker . Traveling by car from Hvolsvollur to Vik takes 1.5 hours. Alternatively, you can take a bus. In April, daytime highs in Vik are 6°C, while nighttime lows are 3°C. Wrap up your sightseeing on the 19th (Fri) early enough to travel to Oslo. Kick off your visit on the 20th (Sat): explore the world behind art at Vigeland Museum, don't miss a visit to The Norwegian Museum of Cultural History, and then contemplate the long history of Akershus Castle and Fortress (Akershus Slott og Festning). On the 21st (Sun), you'll have a packed day of sightseeing: admire the masterpieces at National Gallery of Norway Nasjonalgalleriet, see the interesting displays at The Ibsen Museum, ponder the world of politics at Rådhuset, then explore the engaging exhibits at The Kon-Tiki Museum, and finally take an in-depth tour of Viking Ship Museum. For other places to visit, ratings, photos, and other tourist information, go to the Oslo trip itinerary maker site . You can do a combination of bus and flight from Vik to Oslo in 10 hours. Other options are to do a combination of bus, flight, and train; or do a combination of car and ferry. The time zone difference when traveling from Vik to Oslo is 1 hour. Traveling from Vik in April, you will find days in Oslo are somewhat warmer (11°C), and nights are slightly colder (-1°C). Wrap up your sightseeing on the 21st (Sun) early enough to travel to Stockholm. Popular historic sites such as Stockholm Old Town and Royal Palace are in your itinerary. Get some cultural insight at Vasa Museum and Prins Eugens Waldemarsudde. And it doesn't end there: see the interesting displays at Skansen, admire the masterpieces at Moderna Museet - Stockholm, get outside with Riddarholmen, and learn about all things military at Royal Armory. To see reviews, traveler tips, maps, and tourist information, use the Stockholm online trip itinerary maker . Getting from Oslo to Stockholm by flight takes about 3 hours. Other options: take a train; or drive. In April, daily temperatures in Stockholm can reach 11°C, while at night they dip to 0°C. Finish up your sightseeing early on the 24th (Wed) so you can travel to Helsinki. Start off your visit on the 25th (Thu): take in the spiritual surroundings of Kamppi Chapel of Silence, take in the spiritual surroundings of Rock Church, then get engrossed in the history at Seurasaari Island and Open-Air Museum, then get to know the fascinating history of Toolo Bay (Toolonlahti), and finally get to know the fascinating history of The Esplanadi Park. 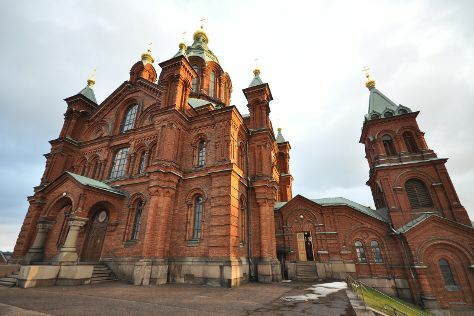 On the next day, contemplate in the serene atmosphere at Uspenskin Cathedral (Uspenskin Katedraali), don't miss a visit to Senate Square, then pause for some serene contemplation at Helsinki Cathedral, then browse the exhibits of Sea Fortress Suomenlinna, and finally take a stroll through Ullanlinna. To find maps, ratings, where to stay, and more tourist information, read our Helsinki trip itinerary planning website . Traveling by flight from Stockholm to Helsinki takes 3 hours. Alternatively, you can ride a ferry; or do a combination of bus and ferry. The time zone difference moving from Central European Time (CET) to Eastern European Time (EET) is 1 hour. In April, daily temperatures in Helsinki can reach 9°C, while at night they dip to 0°C. Cap off your sightseeing on the 26th (Fri) early enough to travel to Copenhagen. Get a sense of the local culture at Rosenborg Castle and Amalienborg. Popular historic sites such as Nyhavn and Church of Our Saviour are in your itinerary. There's much more to do: wander the streets of Stroeget, get a sense of history and politics at Christiansborg Palace, enjoy breathtaking views from Rundetaarn, and take an in-depth tour of National Museum of Denmark. To see photos, reviews, more things to do, and more tourist information, go to the Copenhagen road trip planning site . Traveling by flight from Helsinki to Copenhagen takes 5 hours. Alternatively, you can do a combination of flight and train; or do a combination of flight, taxi, and train. You'll gain 1 hour traveling from Helsinki to Copenhagen due to the time zone difference. Plan for somewhat warmer nights when traveling from Helsinki in April since evenings lows in Copenhagen dip to 3°C. On the 30th (Tue), you'll travel back home.